Quantities. 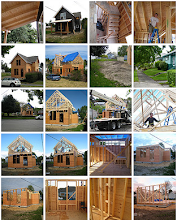 It takes lots of materials to build a house. 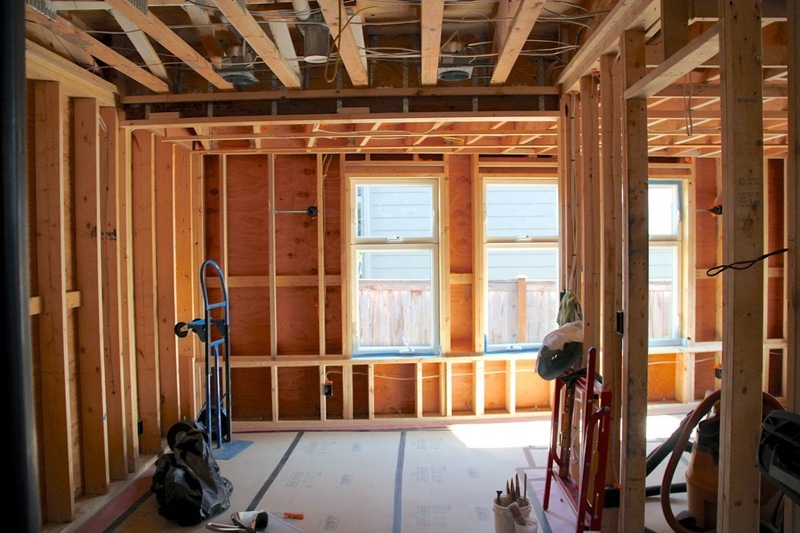 On this day 18,800 pounds of gypsum wallboard (aka drywall, GWB) was delivered and placed throughout the house. Some of it boomed through our second floor deck doors. 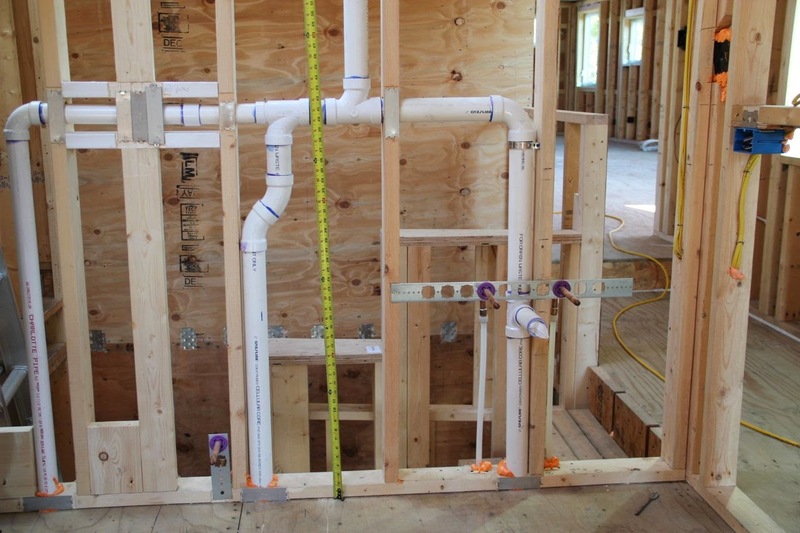 Neil went with 5/8" throughout the house instead of the typical 1/2". This adds a little more sound insulation. 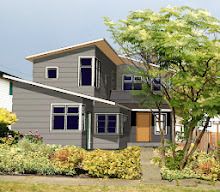 That along with our blown-in insulation and triple pane windows should make the house pretty darn quiet. 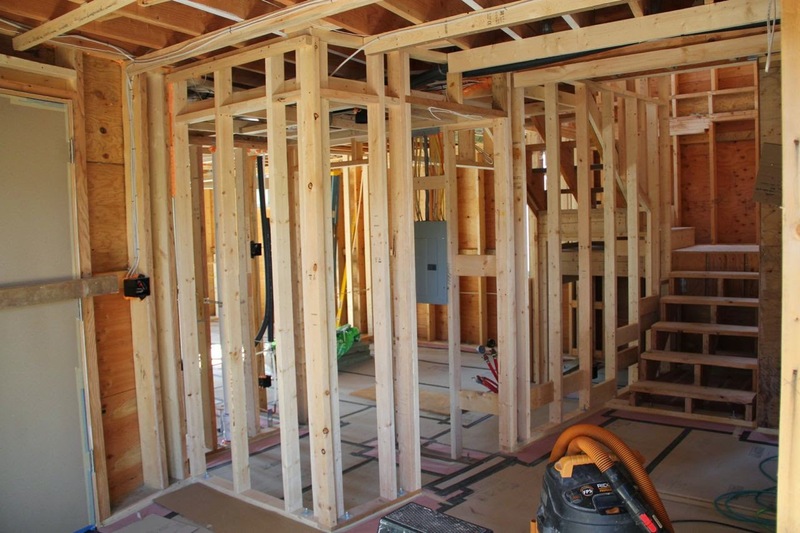 One of the biggest steps we are taking to be more energy efficient in the future, is to add more insulation in the home now. 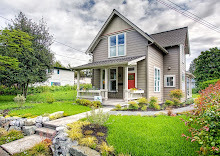 The Washington State Energy code is one of the most strict in the country, but we took it to the next level. 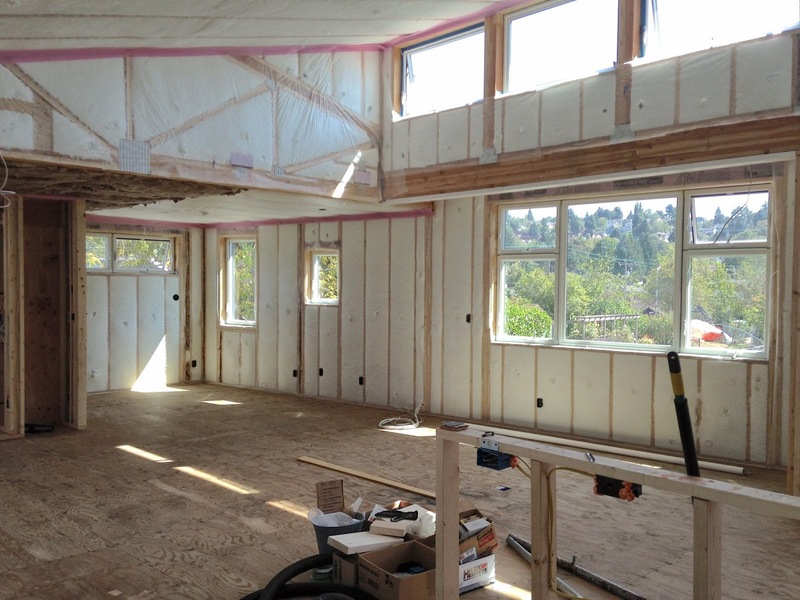 In our 2x6 walls, we used Blown-In-Blanket-Insulation (BIBS) - basically dense packed fiberglass. 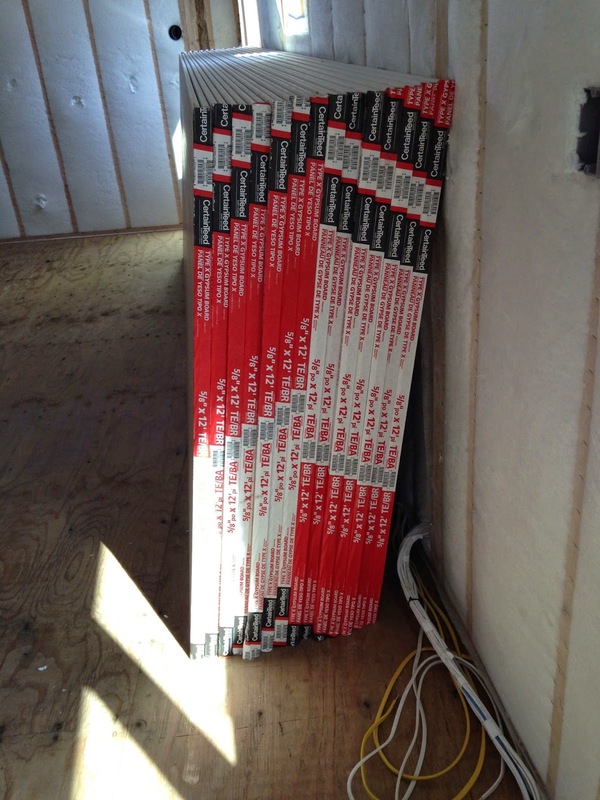 Specifically JM Climate Pro, which gets us R-23 in 2x6 walls. 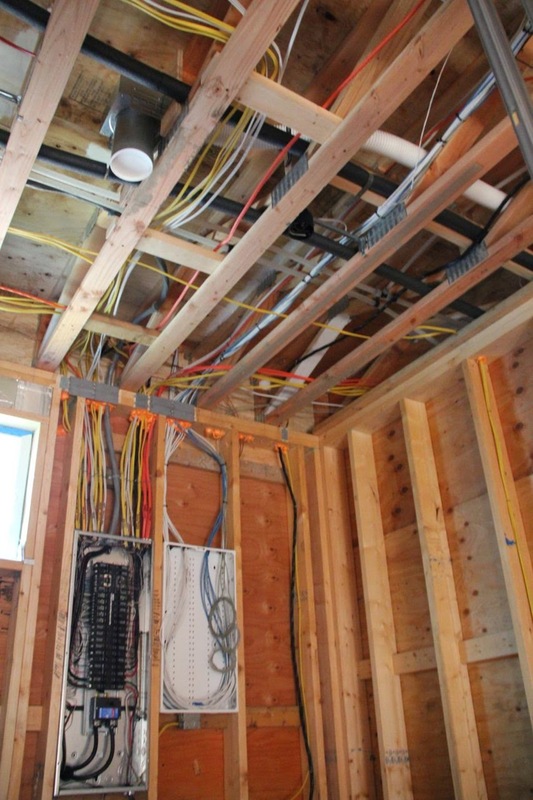 This fills in behind all the electrical and plumbing. You just can't get as good of a value with regular batts. It is a better sound insulation, too. 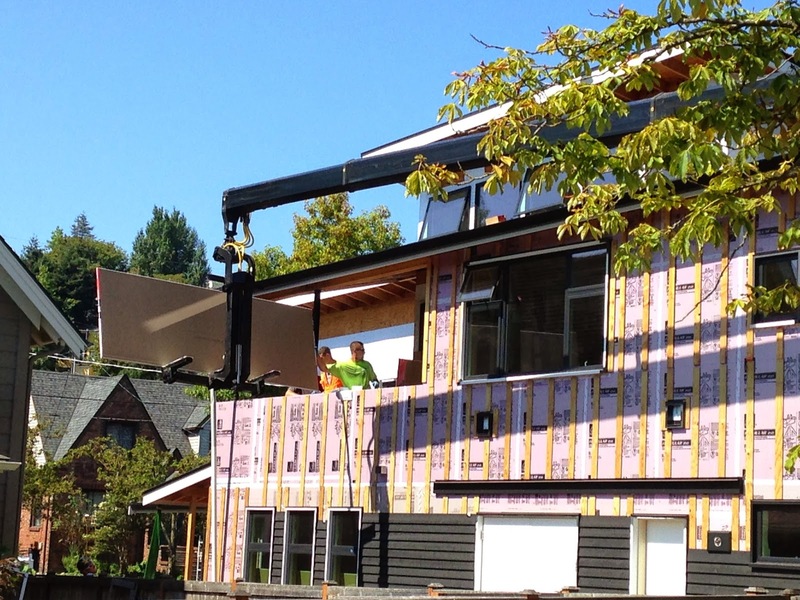 This coupled with our 1-1/2" rigid on the exterior gives us R-30.5 on our walls. 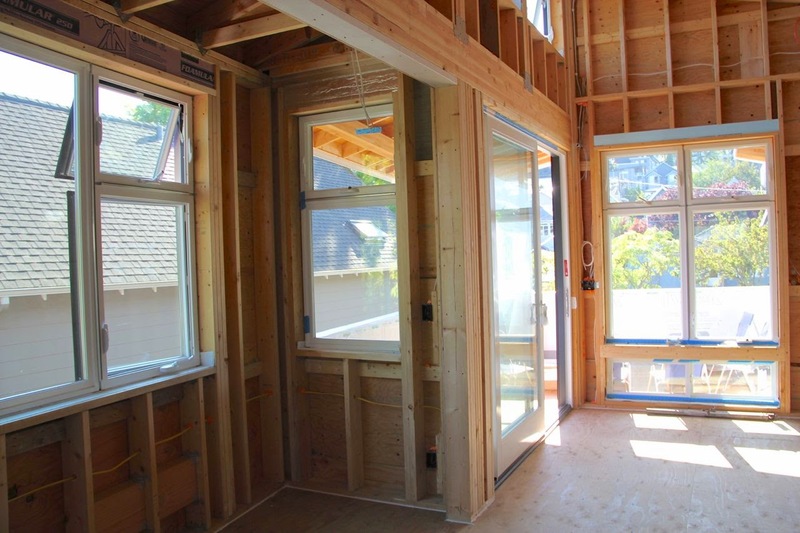 In comparison, 2x4 walls with batt insulation only achieves at best R-15. In our ceilings we have R-60 or better. 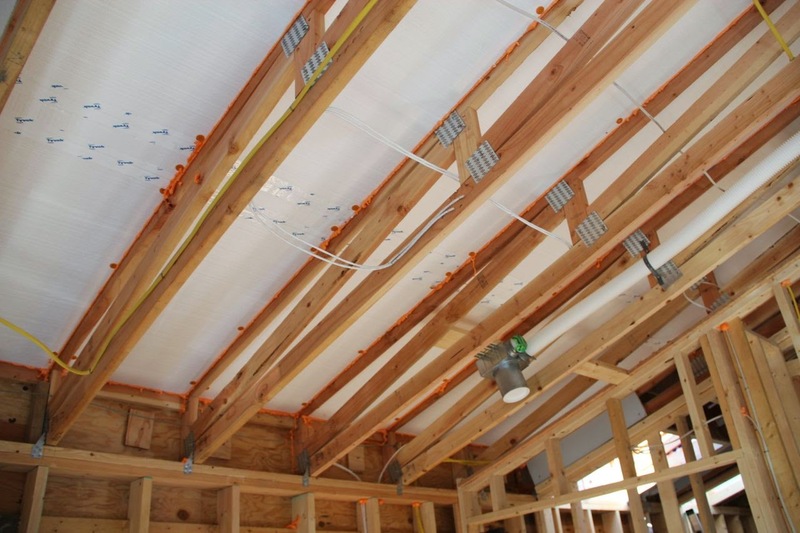 Neil used 1.5" of unfaced rigid insulation as a baffle to create the 2" air channel above the insulation in our vented roof. Then BIBS in the ceiling. In the vaulted spaces we have R-62.4. The pink stuff at the top plate to ceiling intersection is sill sealer...typically used to air seal and separate the bottom mudsill to the concrete stemwall. We are using it here to create another level of airsealing at this intersection. 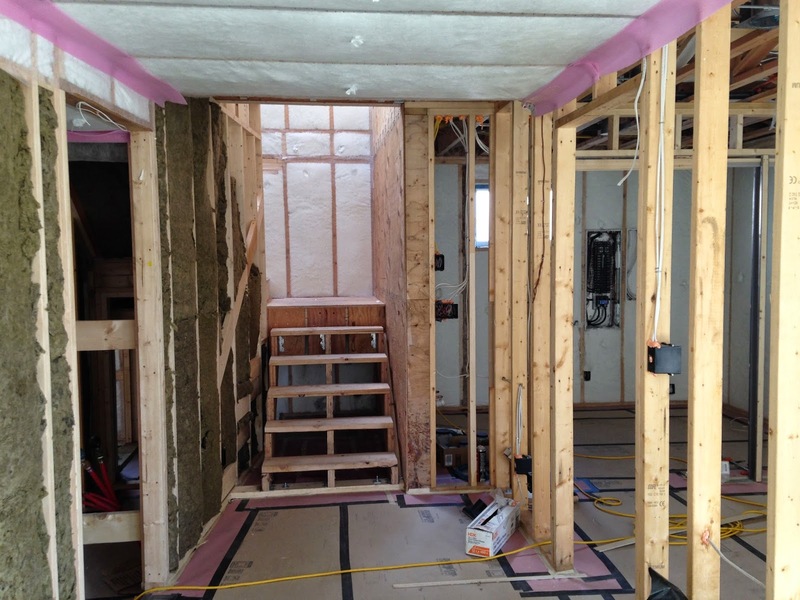 Below is our downstairs entry looking towards the stairwell. To the left you can see a muddy greenish insulation which is rockwool. This is the wall that separates the apartment from the main house and it needed a certain sound rating as well as 1 hour fire rated construction. 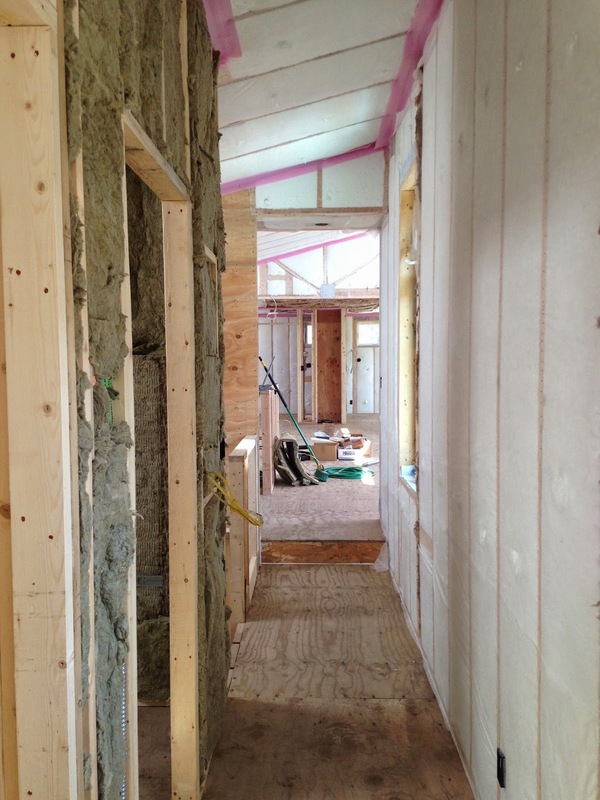 We also used the rockwool in bathroom walls for added sound insulation as seen in the wall separating the upstairs guest bathroom from the hallway below. We had a couple of tricky locations to air seal. Two roof to wall locations that we ended up spraying 3" of closed cell foam before blowing in the BIBS. The spray foam is about R-7 per inch. In these roofs we do not have venting. 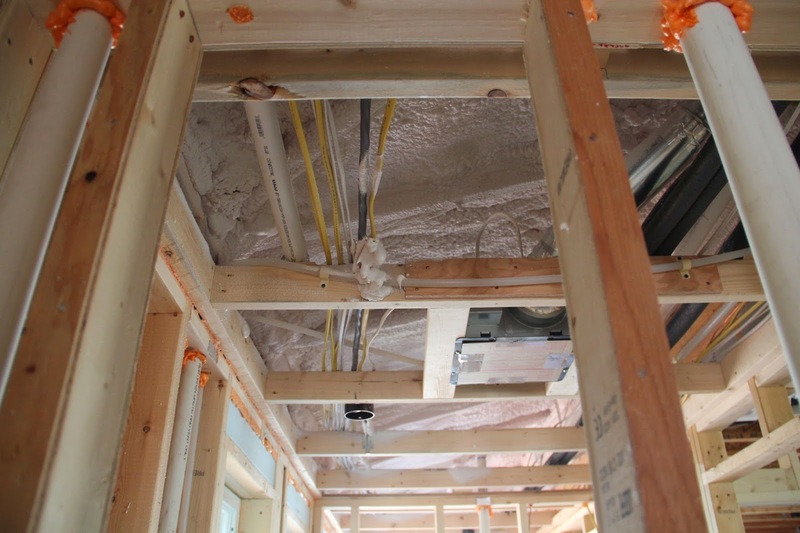 The installers also sprayed 1" closed cell foam at the rim joists. 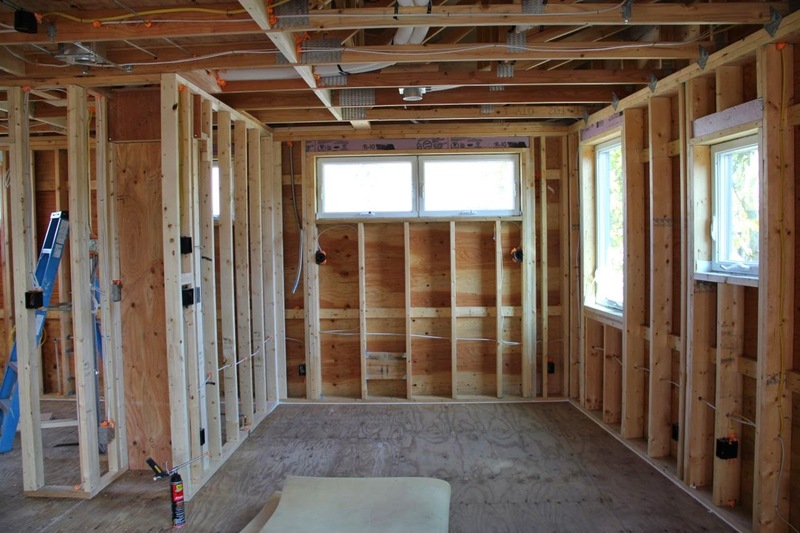 Before insulating, we went around and documented all the wall framing. Neil held a tape and I photographed. 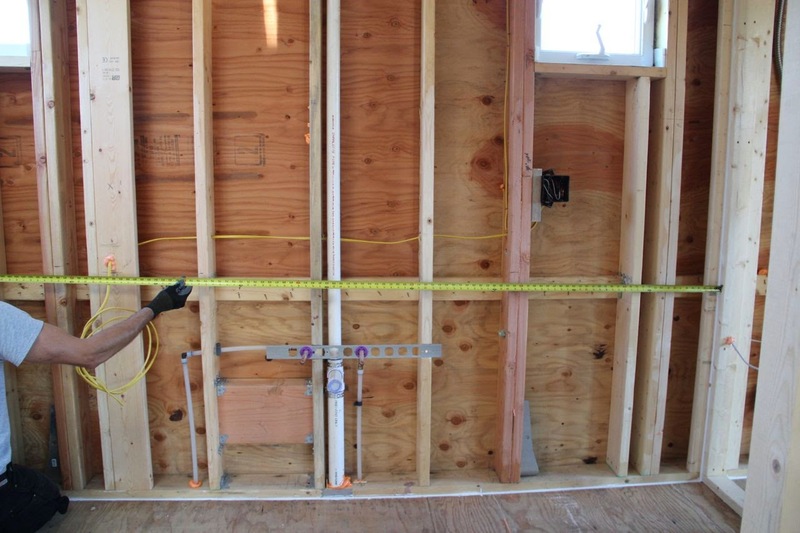 This way we have a record of exactly where all the plumbing, electrical wires and studs are. 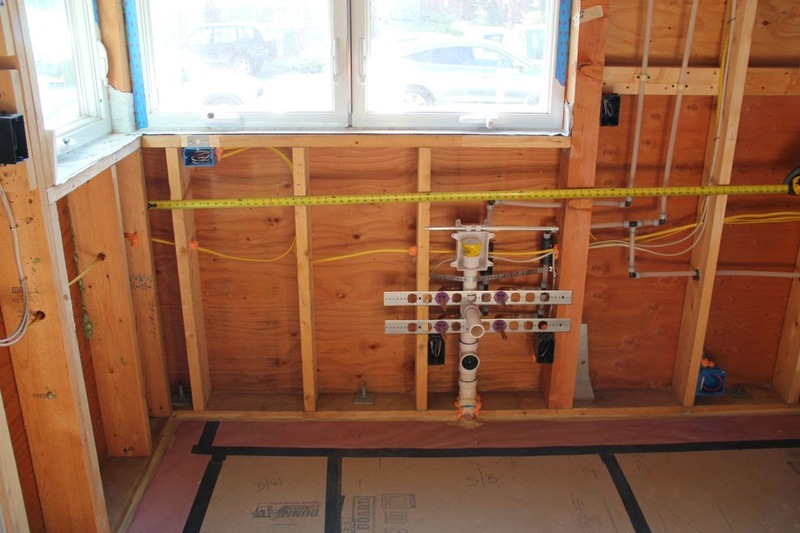 Most of our air sealing had also been done prior to this, so that can be seen in the photos. 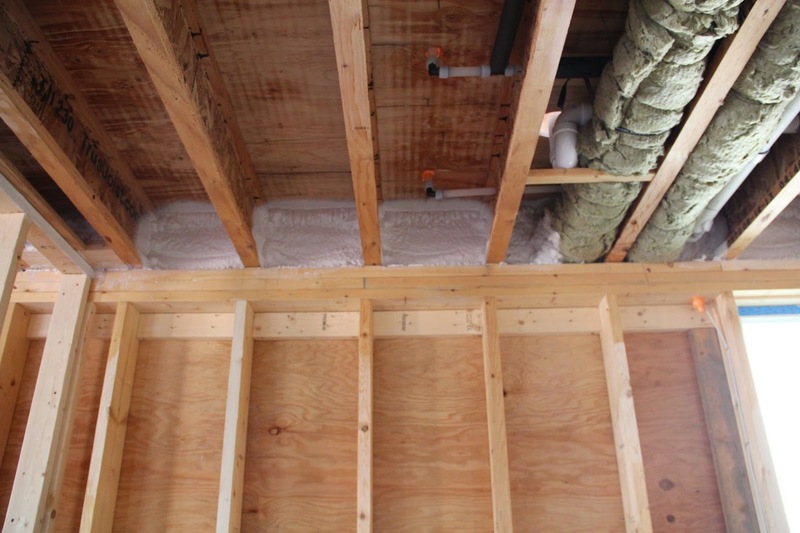 Things like the white caulk line at the base of the wall, the orange expanding foam at penetrations, as well as some trickier air sealing conditions like between our vented attic and living room high wall. 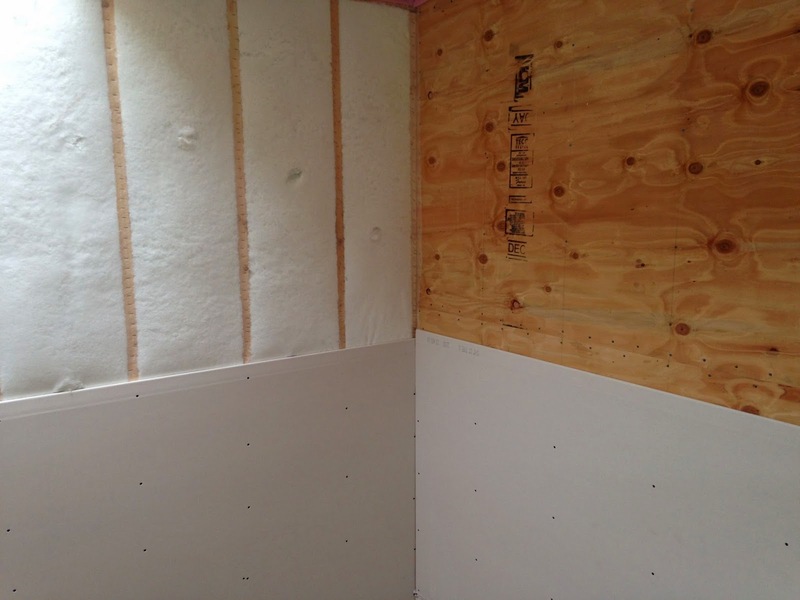 This was dealt with a layer of rigid foam sealed in place. 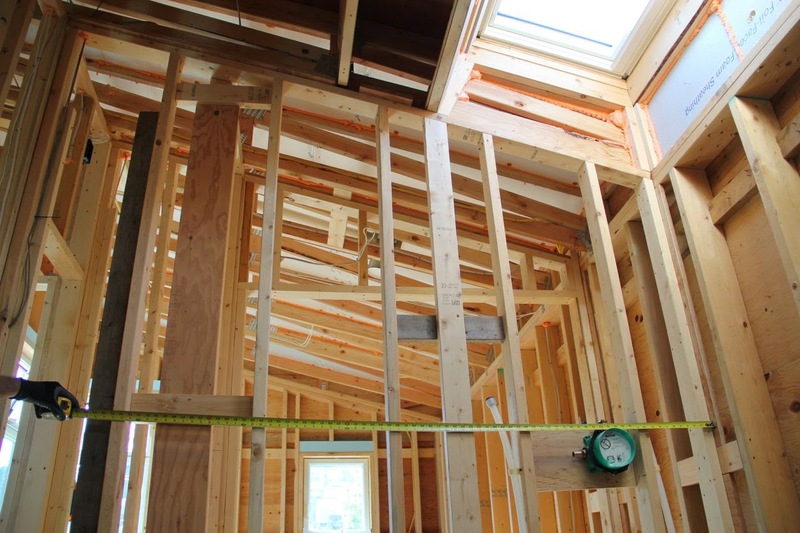 Another item to note, Neil made his own baffles to create a 2" air space above our insulation and below our roof sheathing for our vented roof. That is the white sheets you see below. 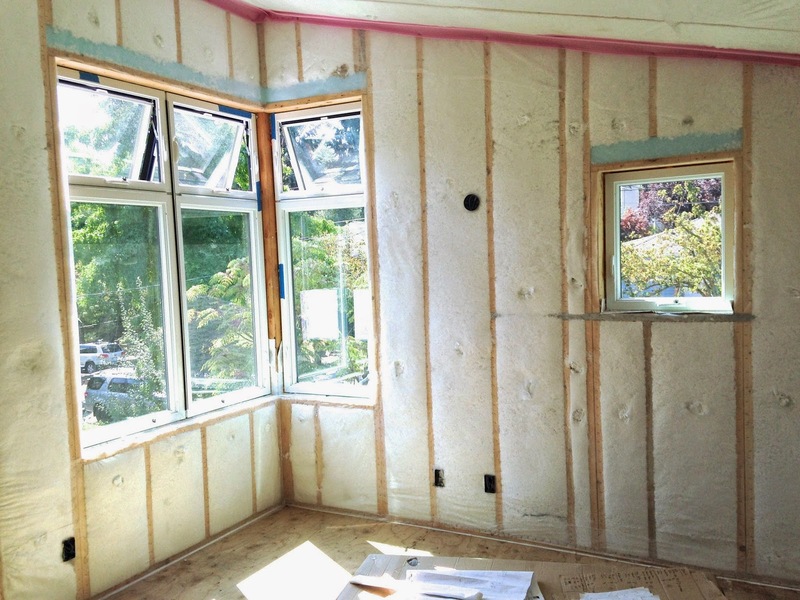 It's actually 2" of non-faced rigid insulation. 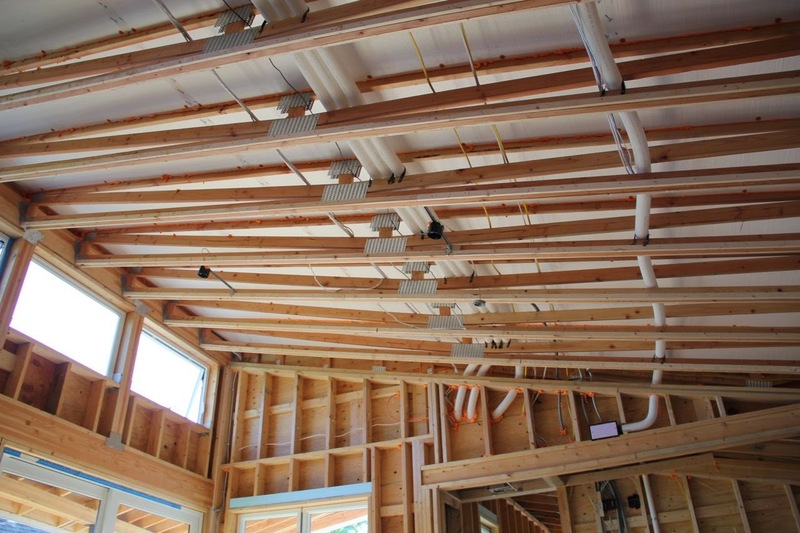 Below that will be BIBS (Blown-in-Blanket-System) a dense packed fiberglass insulation for a total of R-62 in our roof. Code is only R-49. 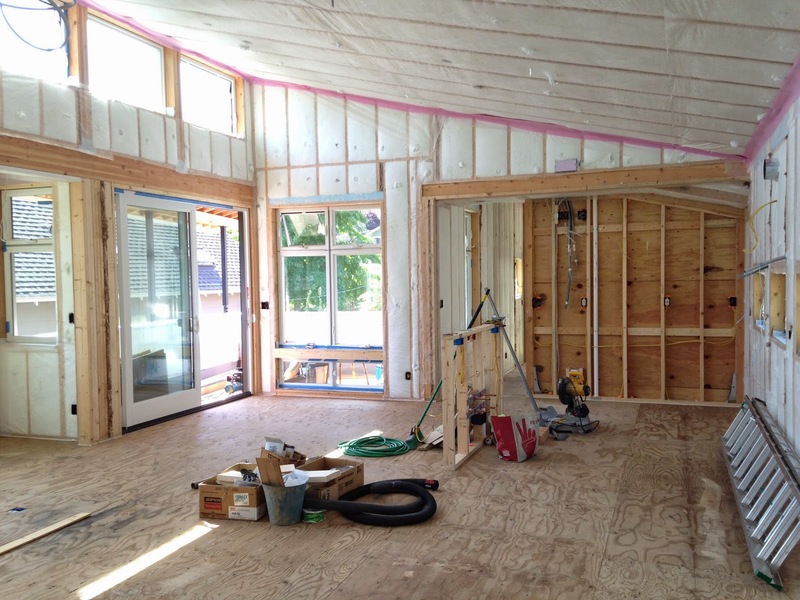 As much as I am looking forward to insulating and drywall, I do love it at this stage. 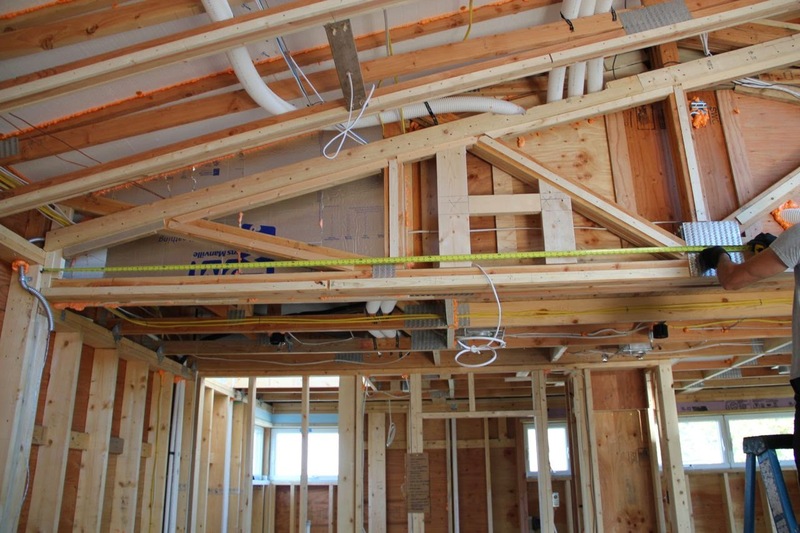 It's so cool to see all the framing...the bones and then all the wires (nerves) of the house.